I have never seen a replica of the Korean War Memorial, the World War I Memorial, the expansive FDR Memorial nor the new World War II Memorial which area all nearby and worth visiting. But, both the Vietnam Veterans Memorial and Vietnam Soldier Statue have had miniature replicas made. The wall souvenir is small, pewter and not that old, but is surprisingly hard to find. 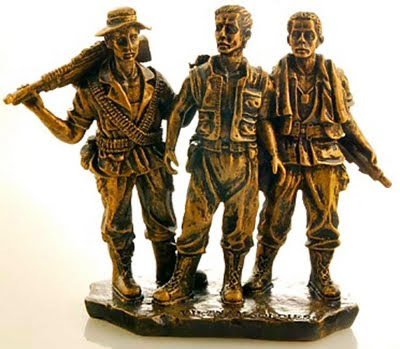 The soldier statue replica can still be purchased in D.C. gift shops and are made of resin. The real memorial honors U.S. service members who fought in the Vietnam War, those who died in service in Vietnam/South East Asia, and those service members who were unaccounted for during the War. The memorial currently consists of three separate parts: the Three Soldiers statue, the Vietnam Women's Memorial, and the Vietnam Veterans Memorial Wall, which is the best-known part of the memorial. The Memorial Wall, designed byMaya Lin, is made up of two gabbro walls 246 feet 9 inches (75 m) long. The walls are sunk into the ground, with the earth behind them. At the highest tip (the apex where they meet), they are 10.1 feet (3 m) high, and they taper to a height of eight inches (20 cm) at their extremities.